Edible Insects Market size was over USD 55 million in 2017 and industry expects to witness significant gains at over 43.5% by 2024. Growing health concerns among consumers owing to consumption of unhealthy foods is expected to stimulate the market size. Shift in trend towards consumption of protein rich foods along with convenience foods and ready-to-eat meals intake will propel industry growth. The product offers various health benefits including lowering down obesity and calories and are highly nutritious even to livestock when offered as feed, resulting into increased market demand. Increasing importance towards farming which require minimum investment along with decline in seafood resource and restrictions imposed by countries on fishing will bolster product demand over the forecast timeframe. Invertebrates are economical and sustainable source of nutritious protein for human and animals, emitting comparatively low GHG and has minimal production cost, resulting into increased product demand. Government initiatives along with education can help in adopting species as food & feed in India, China and Brazil, will lead to enhanced product demand. According to UN’s FAO report, these invertebrates do not require lot of land to increase production, bugs are effective at altering feed to protein as they need 12 times less feed than cattle to produce same amount of protein. Small scale operations coupled with increase in raw material costs force the companies to market the product at higher costs compared to traditional components. Manufacturing companies including EnviroFlight, Bitty Foods, Bugsolutely and Grilo have been conducting a focused R&D to serve the consumers with more suitable solutions, which will give a positive impact to edible insects industry over forecast timeframe. Insects such as black soldier fly larvae, grasshoppers, silkworms or mealworms have nutrient contents compared to that of the traditional feed and have the potential to replace between 10% to 50% of the soymeal feed used in poultry and cattle applications. Soymeal market size accounts for approximately 65% of the total animal feed and is projected to exceed over 1.5 billion tons by 2024. It can be anticipated that, edible insects market size can replace 300 million tons of animal feed. Beetles based edible insects market demand is valued at about USD 16 million in 2017 and is expected to grow over the foreseeable period. Beetle larvae clean up dead plant matter by breaking down the organic matter and has an important role in biodegradation, which is likely to fuel product demand. There are a total more than 80 North American beetles in the Insect Identification database and are used to control water hyacinth invasions, thus enhancing product demand. Caterpillars edible insects market demand is expected to grow over 43.5% by 2024. They are easily harvested and rich source of proteins, minerals and vitamins. Mopane caterpillar improves iron deficiency in diet and comprises of approximately 61% of protein which drives the market demand. These invertebrates feed on tree leaves and their impact on forest ecosystem are the other driving factors accelerating the industry. Grasshoppers, locust & crickets based edible insects market demand was valued at over USD 12.5 million in 2017 and is likely to grow over the projected period. Invertebrates such as grasshoppers have low cholesterol levels than beef & pork and are rich in protein source, bolstering the overall market demand. Crickets are used in farming techniques as it is cost efficient, eco-friendly and non-toxic which will foster the industry growth. 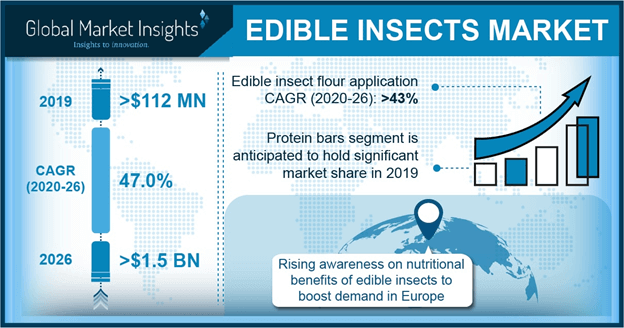 Edible insects market demand from flour application was valued over USD 19.5 million in 2017 and may witness significant gains during the forecasted timeframe. Food product use grasshoppers and cricket powder owing to its essential minerals, amino acids and protein rich content which will foster the edible insects market demand. Cricket flour which is gluten free is used in food products which propel the market demand. Edible insects market size from bars application would register significant growth over 43.5% by 2024. Crickets and mealworms are used in food products owing to their rich source in proteins and amino acids. These bars are mostly used by sportsmen and athletes owing to its gluten free properties which induces the edible insects market demand. North America edible insects market demand, driven by Canada and the U.S. would register significant growth over 43.5% up to 2024. Growing demand for high protein diets and aversion to processed food may further surge product demand. Crickets are mostly consumed in this region for farming techniques and in food applications as it has the ability to break down the organic matter which will stimulate regional industry growth. Asia Pacific led by Thailand and China market size may surpass USD 270 million by 2024. Invertebrates including grasshoppers, crickets, beetles and locusts are widely used in the region. These are accepted as dietary food supplement in these regions due to its protein rich content and is widely used in manufacturing of desserts, smoothies, biscuits and bread, which will further impel the market growth. Europe led by Germany and France edible insects market will witness significant growth at over 43% during the forecast period. Invertebrates including crickets, silkworms and mealworms have strong potential to be used as food or feed. According to EFSA the products are harmless and does not pose any threat to the farming techniques thereby stimulating industry growth. Edible insects market share is highly fragmented with major industry players include EnviroFlight, Haocheng Mealworm, AgriProtein and Entomo Farms. Other manufacturing companies include Bitty Foods, Gather Foods, Edible Inc. and Bensbugs which serve to local and international market. 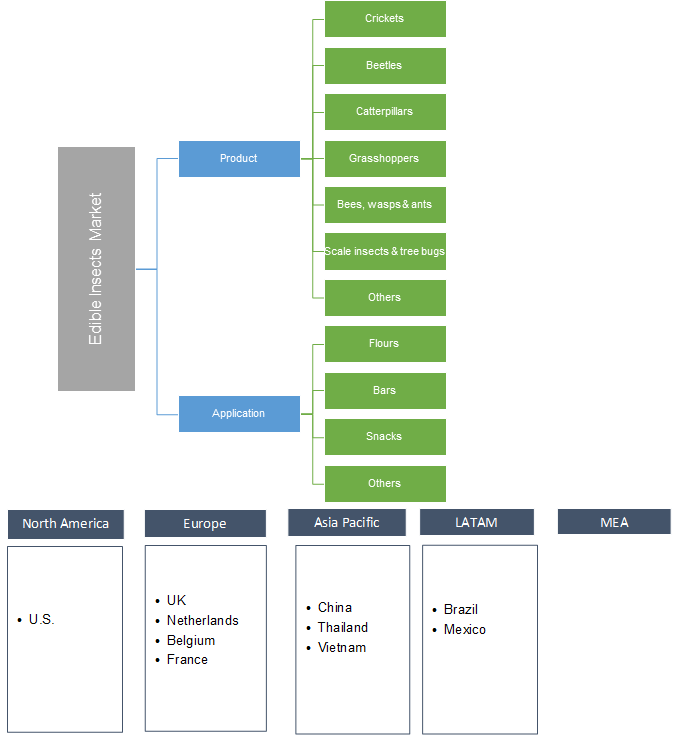 Major players are collaborating to increase their regional presence in various applications and focusing on new product development to gain competitive advantage. The market may witness alliance in the form of mergers & acquisitions and joint ventures which may boost product portfolio and brace global presence. Edible insects include crickets, caterpillars, grasshoppers and others and are suitable for both animal and human consumption. Increasing consumer awareness regarding edible invertebrates in human consumption to improve overall health is likely propel the product demand. These products require less water and emits less GHG. Companies are focusing on acquiring manufacturers who are involved in bug production. The products are also recognized safe by GRAS which in turn will stimulate the market growth.